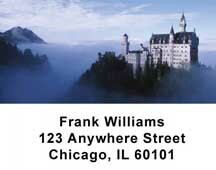 European Castle Checks contain 4 photographs of the world's most beautiful castles. This makes these checks the ideal checks for those fascinated with castles or who like to enjoy a little history. Each castle is well detailed in a semi-transparent image in the background of the check. There are no borders along the edges of the check, just as there are no borders when viewing the castles in person. And with the colors of nature and subtle imagery, these checks do not overpower the handwriting on the check when you write on and use a check for payment. For those appreciative of the wonders of the world, European Castle Checks make a great asset.